A beautiful location to rest and bring the canoes ashore while traveling the Oxtongue River in Oxtongue River-Ragged Falls Provincial Park in Ontario. Surrounded by Autumn hues, the sounds of nature ring clear. The best way to explore the wilderness where the Oxtongue River flows in the Oxtongue River-Ragged Falls Provincial Park in Ontario, Canada is by canoe. Visitors to the park who have rented a couple of canoes, pulled them up onto the rocky river bank under the beautiful Autumn colored trees where one can relax, snack and enjoy the peacefulness of the wilderness. Some areas along the river are fairly shallow making it hard to maneuver the canoe around the jagged rocks. Many stops can be made while traveling along the Oxtongue River, but always be aware of a waterfall quickly approaching which could easily lead to danger for less experienced canoeists. Algonquin Outfitters is a rental business found along the Oxtongue River in Oxtongue River-Ragged Falls Provincial Park in Ontario which supplies the life jackets, canoes and oars. Autumn is one of the prettiest and most tranquil times of year to canoe the river. 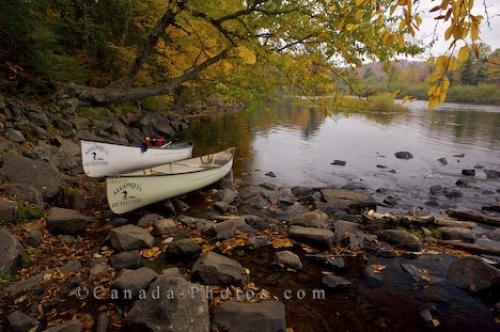 Picture of canoes docked on the river bank in Oxtongue River-Ragged Falls Provincial Park in Ontario during Autumn.